Well, I finally broke down and bought a new rig this week. You may recall I was debating between a Yaesu 950, Kenwood TS-590, Elecraft K3, and Ten Tec Eagle. I ended up buying a Kenwood TS-590. What led to my decision, you ask? The simplicity of the Ten Tec Eagle is nice and refreshing, but I just couldn’t bear spending over $1,800 for such a simple rig. It bugged me that the MARS mod wasn’t readily available. This is one of my idiosyncrasies; any rig that I have must be able to transmit on whatever bands its capable of transmitting on, and I abhor hardware limited by software. And for over a kilobuck, can’t Ten Tec spring for a second antenna connector? Volumes have been written about the Elecraft K3, and any review below a 5 out of 5 gets dirty looks from the studio audience. Yes, it’s a great rig, and initially it looks like a great deal until you start adding on the add-ons you really need to operate this rig. Right off the bat it’s $2,100 for a 100 watt rig. If you’re like me you’ll want a CW filter, a tighter phone filter, perhaps one to listen to and operate AM, and the general coverage filter band pass unit, and you’re looking at another $580. Also, the chassis of the K3 is below what I would consider for a rig in this price class. It’s not badly designed, but it’s really time Elecraft puts the big boy pants on and makes a die cast chassis. I know someone will quip that the Yaesu 950 and Kenwood TS-590 receivers aren’t as good as the K3. You’re absolutely correct. Is that extra few dB of IMD performance or receiver sensitivity really worth an extra $500 – $1K? I was torn between the Yaesu 950 and Kenwood TS-590. Two things tipped the scales in Kenwood’s favor. A read several reviews about the Yaesu’s multiple roofing filters being not that useful, however they made it a major part of the user interface on the front panel. The other mention was Yaesu’s menuing system. Having three Yaesu products currently I’m quite familiar with Yaesu’s menus, however I can’t say I really like them. 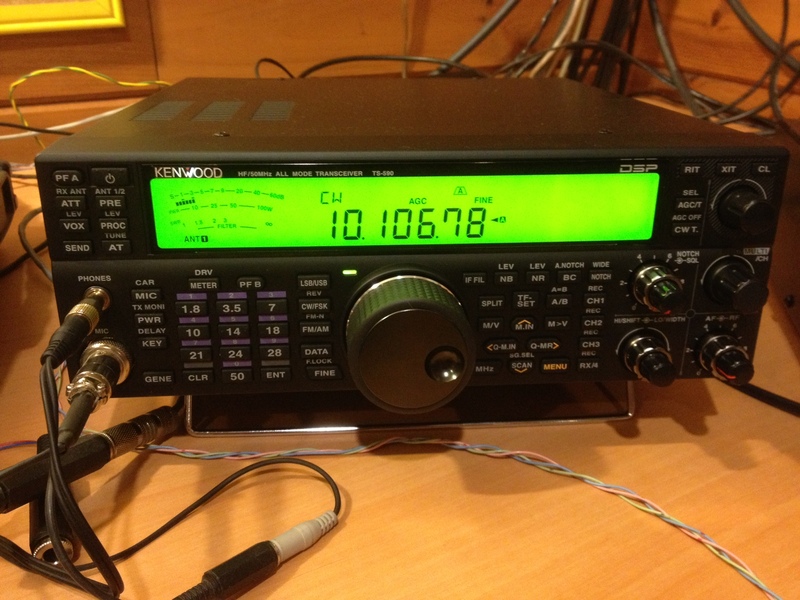 A few reviews of the Kenwood TS-590 indicated better performance on CW than the 950. Admittedly I wanted to give Kenwood another try after their HF “design drought” of eight years, my fond memories of Kenwood back in the 80s and 90s, and the 850 I have has given me lots of great service for 14 years. I was a bit nervous about the TS-590 having operated a TS-570 years ago at Field Day and being disappointed in the receiver, however Kenwood literature, which was quite extensive, indicated that the 590 was designed anew from the ground up. The TS-590 so far hasn’t disappointed me. I was able to figure out nearly all of the functions in the first 15 minutes without cracking open the manual. Power, mic gain, and VOX settings are easily accessed with single keystrokes and don’t require menu navigation. The menu is accessed via a button aptly labeled MENU. The knobs have a quality feel to them and the front interface is consistent and well laid out. What don’t I like? Two items: the number keypad on the left side has the bands (1.8, 3.5, 7, 10, etc.) as the primary marking on the buttons and the number (1, 2, 3, 4…) are secondary, which gets confusing when doing direct frequency entry. The second item is the CW QSK. Much like my TS-850, it makes more relay noise than I would like, however it sounds good in the headphones. The manual is very well laid out, and doesn’t have the Japanglish commonly found in older Kenwood manuals. The rig achieves a nice balance between simplicity and complexity, not being overly flashy and offering a straightforward and useful display. The free software controls every aspect of the rig, down to the AF and RF gain and power, and it’s a rather well designed and intuitive application. New firmware can be uploaded to the rig as it becomes available. I especially like the filter controls which are on one knob. In CW mode it acts in shift and width mode, and in phone it changes to lo cut / high cut, which makes a lot of sense. Having owned two FT-950s and now a TS-590 I can assure you, you made the right choice. They are both nice radios (unless one lives by Sherwood reviews) but the TS-590 receiver has an edge over the 950. Also “handling” the radio during operation is much better and as you noted, straight forward. Hi Mike. Thanks for your comment. I continue to be very pleased with the radio. The free control and VoIP software from Kenwood wasn’t even on my evaluation radar, but now that I’ve gotten into it more, I’m blown away by it and I’ve been motivated to automate my shack. (I’ll hopefully have an article on this soon). While the TS-590 isn’t the best rig looking at the specs, I think it has one of the highest value to cost ratios in amateur radio today. Well .. specs are one thing (hence my comment towards Sherwood ratings) and real life is a whole different dimension. I looked at the K3 as alternative but couldn’t justify the additional cost for the “perceived” advantage. I don’t know how the TS-590 performs on phone because I don’t use that but for CW, RTTY and PSK it is IMHO unbeatable in this price class. Remote capabilities would be nice for CW. Maybe I smell my next project, a CW remote keyer based on an Atmega328 :).